The introduction 991.2 version of Porsche’s venerable 911 Carrera was somewhat controversial for the Porsche connoisseur. 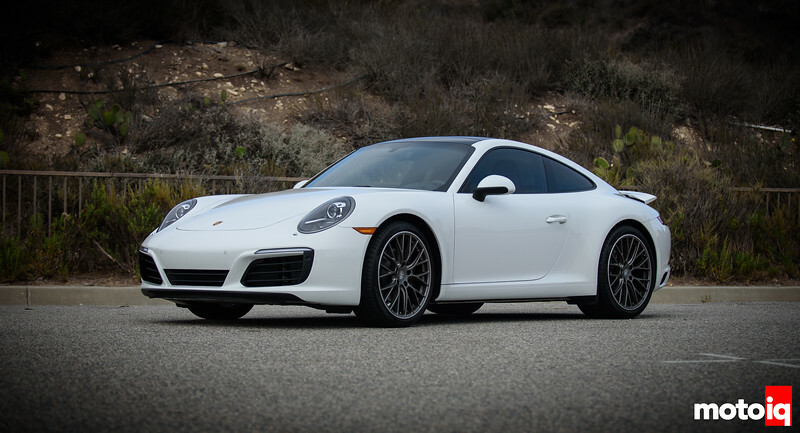 Previous versions of the Carrera were traditionally naturally aspirated with the 991.1 model having 3.4 and 3.8 liter offerings with 350 to 430 hp. Turbocharging was reserved for the traditional Turbo models which were 3.8 liter twin turbo supercars with up to 580 hp. For the 2017 model year the 991 was revised. In response to ever-tightening emissions standards and the desire to provide more performance with better fuel economy, the 991.2 was introduced with turbochargers across the board with a new 3 liter twin turbo engine. The new engine has, although smaller, better performance than its NA predecessor. It has more power and torque, ranging from 370 to 450 hp depending on the model. Although all 911’s are now technically turbos, the traditional Turbo model is still a higher powered 3.8 liter. Although the standard 911 is now pretty powerful, upstart Porsche tuner Vektor Performance saw a place where there was some room to improve upon the factory engineering with no negative compromises at all. The stock factory exhaust manifolds are pretty corked up, looking to be simple logs feeding the turbos. To replace the restrictive log manifolds Vektor has come up with some beautiful equal length headers that package perfectly within the same envelope as the factory parts. The Vektor Performance headers are something to drool over and are every bit as refined as the car they bolt-on to. 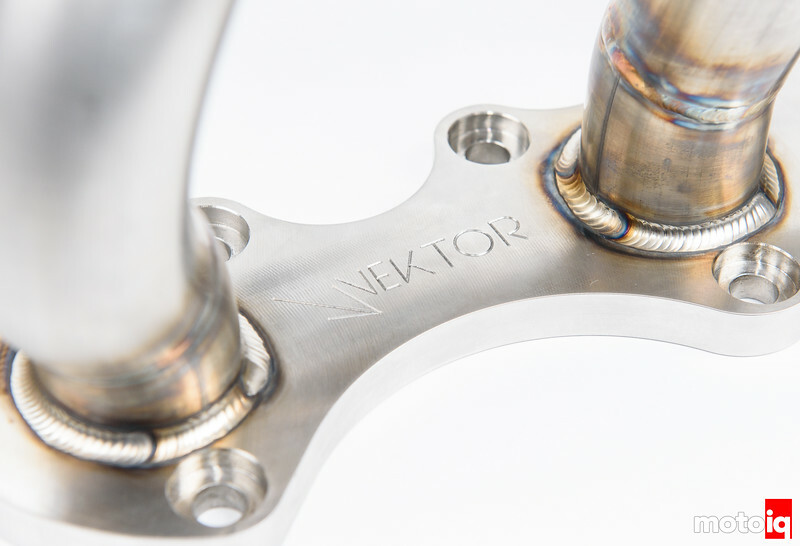 The Vektor headers are constructed from 321 stainless steel. 321 is one of the most heat-resistant stainless alloys available and is known for its strength retention at high temperatures. 321 is used for many high-end race car headers where its superior high temp properties allow the tubing to be thinner and lighter. However, in this application the 321 tubing is thick-wall for strength as it is on the 911 stock. Since the exhaust manifolds need to be strong to help support the turbos and the exhaust. 321 is also a wise choice pre-turbo. It has about 50% less thermal conductivity than cast iron or regular steel which means more heat reaches the turbine, reducing spool time and increasing turbine efficiency. More heat also helps light off the catalytic converters faster so emissions are not affected as much. The flanges on the Vektor Performance headers are CNC machined for perfect flatness and port match accuracy. They are 1/2″ thick so no warping or leaking either. These headers will seal as well as or better than the factory manifolds. The thickness also allows for post welding hand finishing for a perfectly smooth and consistent transition from the exhaust ports to the header runners. 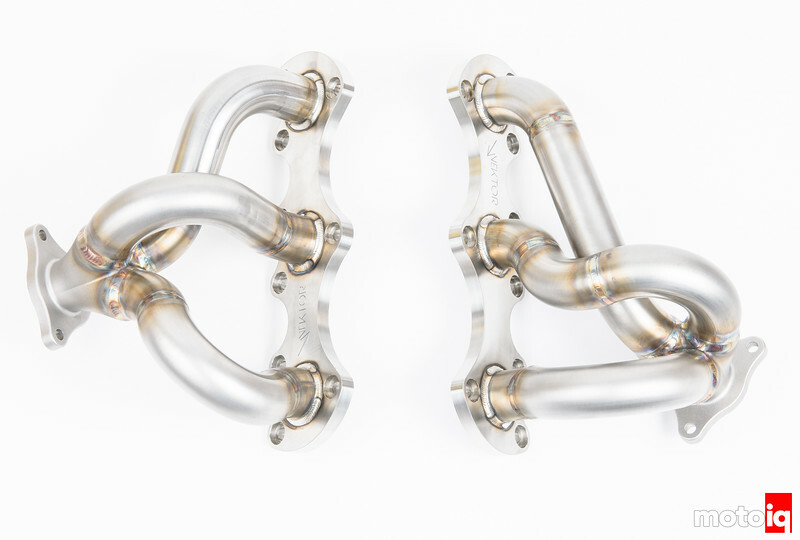 Vector Performance headers are made in the USA using all certified American made tubing and materials. A critical part of the Vektor Performance header is the collector. 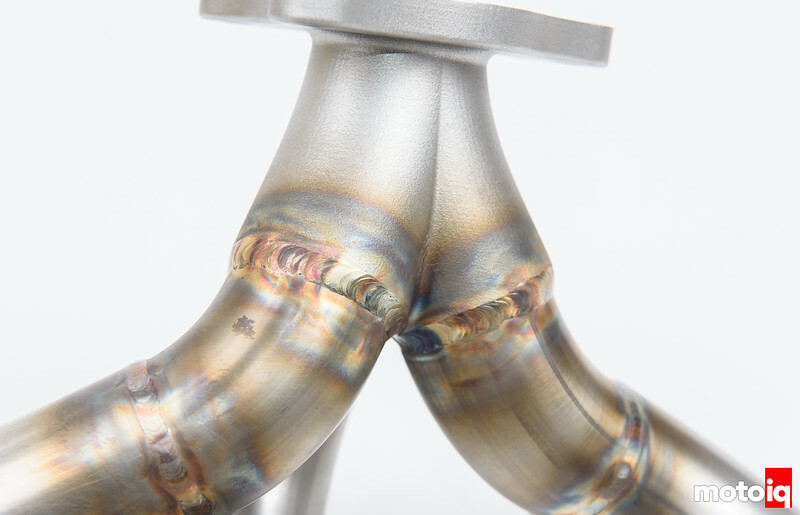 The header uses an unusual investment casting instead of a fabricated merge. The cast collector allows for complicated internal geometry for better flow and maintains strength as all of the turbos weight hangs from it. After admiring Porsche’s from afar for years and pretty much driving every Porsche made from the 60-90’s my thought has always been work harder and save up for the Turbo model. But since every model is now turbo like you point out and with the aftermarket coming to the rescue like these Vecktor headers it doesn’t seem that thought it really as valid anymore. Porsche’s in particular are known to be one of those cars that aftermarket parts often make less hp than stock so it’s great to see the opposite. The 991.2 turbo is in another world compared to the 991.2 carrera. You’re going to spend a ton of money to get the 3.0L to the 3.8L level. I’ve heard from monstaka (french tuner) that catless pipes made a huge difference on their 510hp 991.2 S.
The base Carrera does start $70k below the base Turbo. Suppose you start with the Carrera GTS which has the biggest turbos and is $40k cheaper than a base Turbo. A tune alone on 93 octane bumps up the power 19%, or just short of the Turbo. The biggest exhaust restrictions on the 911s are the headers and cats. On the stock tune, there’s not much to be gained with an exhaust, but they may be different with a tune. Add in headers to the tune on a GTS and it should be right at Turbo power. So basically for about $5k. Granted, your warranty is probably gone. The GTS does weigh about 200lbs less than the Turbo. Add some high flow cats and intercoolers for even more power. I’d guesstimate another 30whp or so. I agree, Porsche aftermarket parts, as well as other exotic and semi-exotic cars, often have poorly engineered and validated performance parts that are both expensive and not performance enhancing. Sometimes they are poorly made as well. I have been surprised that the parts for Japanese cars for instance from reputable manufacturers are often made better and perform better. These Vektor Performance headers are impressive however in construction quality, engineering, and performance increase. I would really like to add a cat back and an access port to these. A few tweaks and you could probably get a Carrera to easily give the high buck Turbos and GT3’s the business. With pure bolt-ons (exhaust, headers, ICs, hybrid turbos), E85, and COBB AccessPort, it’ll do over 600whp. Figure you buy a base model off lease for ~$70k, you can have a 600whp Turbo beating car for under $90k. From what I understand the engine is very reliable at this power level as well.